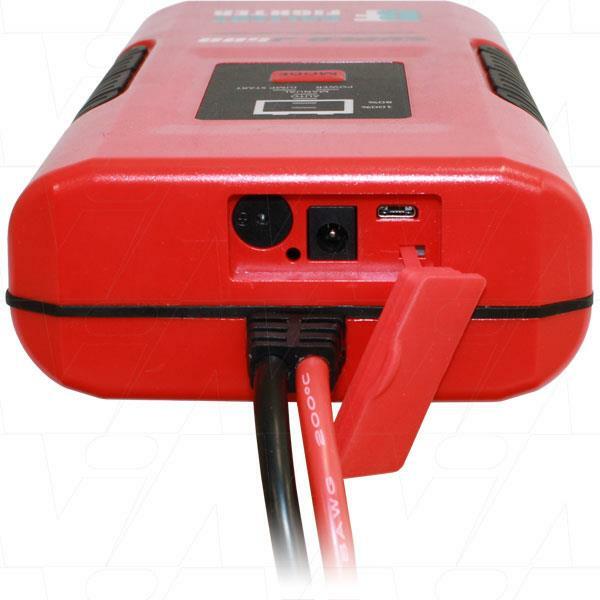 Super Capacitor Jump Starter with 500 Amp Cranking Output. 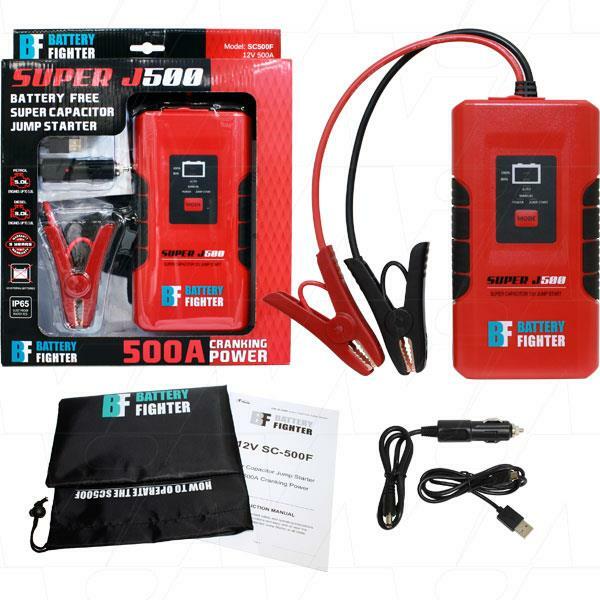 Battery Fighter SC500F Super J500 BATTERY FREE Super Capacitor Jump Starter with 500 Amp Cranking Output. Super J500 (SC500F) 12V 500A BATTERY FREE Super Capacitor Jump Starter. Using energy efficient EDLC super capacitor technology, the Super J500 can be charged and ready to jump start a 12V vehicle in under 180 seconds! The Super J500 can even be charged using the vehicle's own FLAT battery! No one plans for their car battery to fail, even when serviced regularly, but with the Super J500 a broken down car (where a flat battery is the cause) can be up and running again in just 3 minutes. No roadside assistance or tow trucks required. No need to wait for a friend or kind stranger to bring jumper cables. The Super J500 is maintenance free and always ready to use WHEN YOU NEED IT. Via direct connection to 12V automotive battery through the alligator clamps. Light weight and compact compared to old style lead acid jump starters. With no internal battery there is no storage and no transportation concerns as there are no harmful chemicals or toxic metals. Long service life – up to 500,000 charge/discharge cycles means the SC500F will last approximately 100 years. Microprocessor controlled for ultimate ease of use and safety. IP65 rated dust proof and water resistant housing. Safety features: overload protection, reverse polarity protection, over charge protection, over temperature protection. *This jump starter might not be suitable for certain DIESEL engines that require high power to activate the vehicle’s glow plug. SC500F with alligator clip jumper cables. Handy carry bag and user manual.